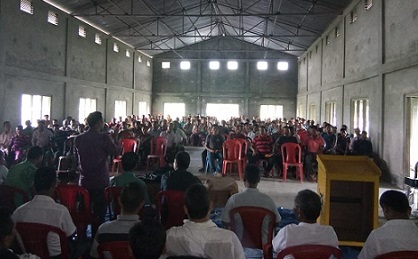 The Kokrajhar District Committee of the All Bodo Students’ Union (ABSU) has formed a strong reception committee for its 50th annual conference of the union on Sunday at Bodoland Dorbar Community hall in Patgaon in Kokrajhar district. The 50th annual conference of the Kokrajhar District Committee of All Bodo Students’ Union will be held on December 21, 22 and 23, 2018 at Patgaon Provincialiced High School with a three-day colourful programme. The meeting on Sunday was presided over by Janak Uzir, president of the Kokrajhar District Committee of ABSU. During this meeting, Meswarsing Basumatary and Janil Kumar Brahma were selected as the chairman and convenor of the reception committee respectively. The meeting was also attended by Baneswar Basumatary, president of the Kokrajhar District Committee, Bodo Sahitya Sabha, Bijitgiri Basumatary, president of KDC, Dularai Harimu Afad. The meeting was also participated by many public and local intellectuals within area under the Patgaon Anchalik ABSU’s jurisdiction.